Review posted August 20, 2016. Arthur A. Levine Books, Scholastic, 2016. 241 pages. This sequel to The Great Greene Heist can be enjoyed on its own, though why limit the fun? 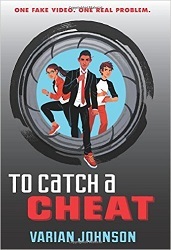 The first book explains how Jackson Greene's team was assembled, but other than that, you can go on with the story in To Catch a Cheat. Jackson Greene keeps trying to give up running cons. But someone has hacked the new security cameras at school, backed up the toilets and flooded the school -- and faked footage of Jackson and his team doing the deed. Their terms: Steal the key to Mrs. Clark's legendary end-of-term exam, or the fake video footage will be turned over to the principal. The principal doesn't trust Jackson, so he won't wait for them to prove the video was faked. What's more, they have to include two of their opponents in the exam heist. But Jackson and his team are pretty sure those two aren't the real mastermind behind the plot. Who has it in for Jackson? And how can they get the fake video without letting anyone get away with cheating? I'll be honest -- I'm not sure I followed every step of the elaborate plan Jackson and his friends worked out. But I definitely enjoyed the journey. Again, To Catch a Cheat has a multicultural cast and realistic middle school students -- smart and tech-savvy, but definitely still kids. Jackson has patched things up with Gaby de la Cruz and is spending a lot of time with her, but now the caper he's having trouble planning is when to kiss her. More good-natured fun and cleverness. What could be better? Elaborate plans for a team to break into school and steal a test -- but also work it out that the cheats are the ones who get caught. Can they pull it off? Who better than Jackson Greene? He's trying to stay retired, but what can a con artist do when he gets framed?